Like most first time homeowners, our décor budget is usually somewhat slim. I love seeing the years trends in glossy magazines, like the fabric wrapped pumpkins and fall leaves that abound a beautiful mantle or tablescape. I could seriously let my mind take me away! My pocketbook, on the other hand, screams in opposition. 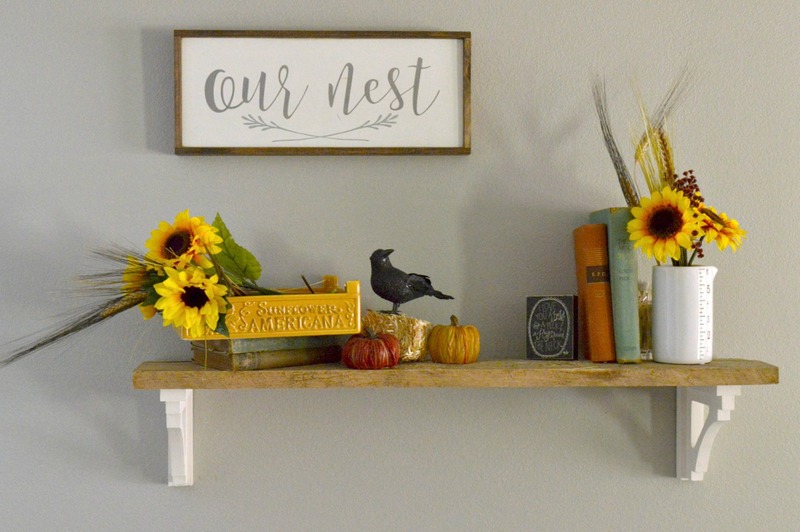 Don’t worry, there are still ways to create some beautiful fall vignettes around your own home even on a Dollar Tree budget. 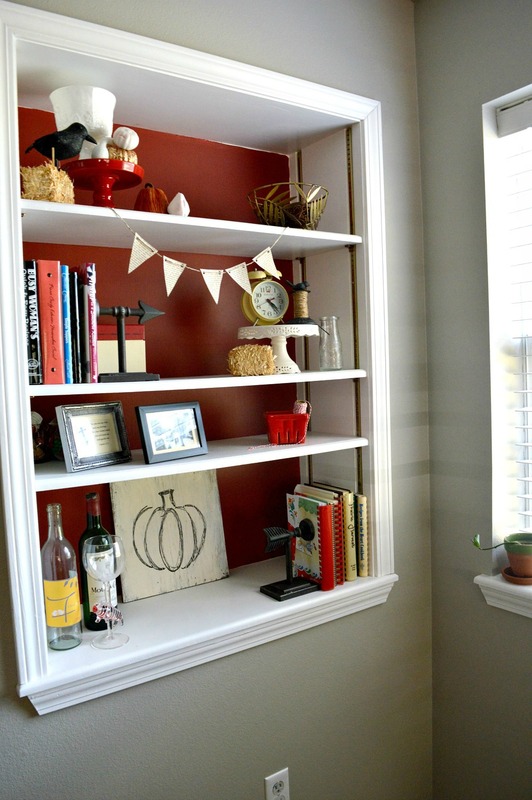 So I’ve gathered my top seven tricks to decorate for fall on a budget. So today, I wanted to share some of the tips and tricks I’ve used to add fun fall pieces to my stash over the years. Ultimately it takes a little patience and doing little by little every year. My very first tip is to use what you already own. Simply rearranging your main décor areas can really freshen things up for a new season. Candles, mirrors, baskets, and lanterns are great classic pieces that you can move from room to room fairly easy. You never know what fun combination you may come up with by just trying things here and there. The second tip is to be creative. Burlap has become a classic fall staple. You can grab a yard from your local store for just a few dollars. Cutting it into triangles and using some craft paint to paint letters is a great way to make your own fall banner. Know someone who owns a Silhouette or Cricut? 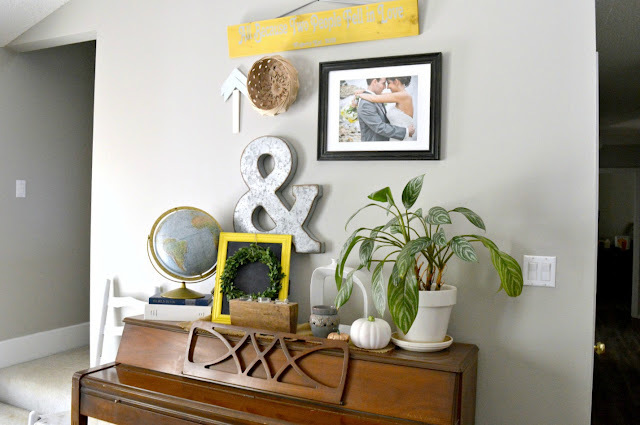 See if you could snag some vinyl letters to make a simple “thankful” sign from some scrap lumber. Snag some fun pieces from yard sales. Fall is a great time to find many yard sales and antique shows. This is a great way to find buckets, crates, and bowls. Then, simply add some fall florals to it to make a perfect fall bouquet. Raid your grandmother’s old decor stash. What’s one mans trash, is another man’s treasure. Eventually one day we will have piles and piles of décor junk that simply find their way to the back of a closet. But for those of us just getting started, using this resource is an excellent way to add to your personal pile. I came home with bags upon bags of fall florals. Don’t be afraid to take things apart and repurpose. See the centerpiece above? The filler I have in my dough bowls consisted of a cornucopia’s guts and a baggie with a cute scarecrow on the front. I took both apart and used the florals and the pumpkins and gourds to fill up the bowl. 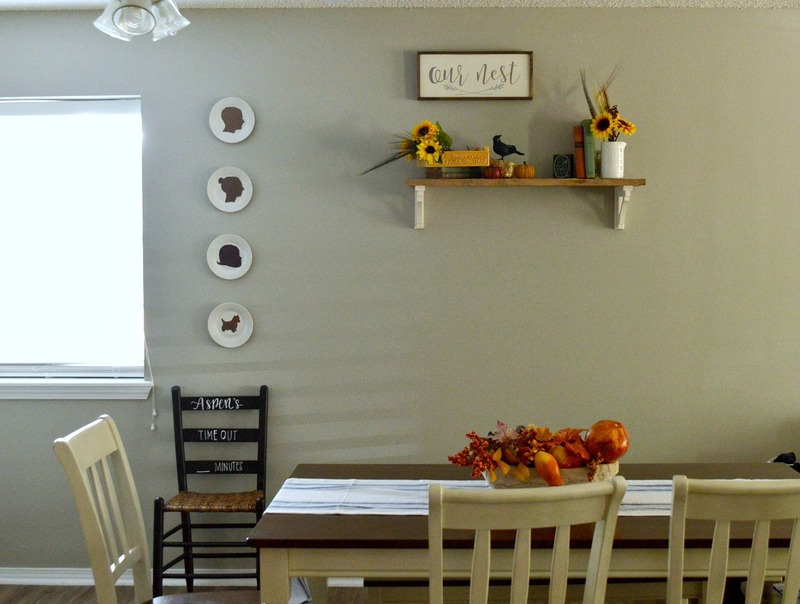 Hand-me-downs are a memorable way to decorate for fall on a budget. Tip #5 in how to decorate for fall on a budget is to make a stop by the Dollar Tree. They usually have a great supply of fall pieces for just $1. I found the small hay bells, crows, and pumpkins there last year. I took several large and brightly colored Styrofoam pumpkins and spray painted them white. Check out the online swap shops. Last year I scored a couple of boxes full of fall sunflowers and straw from leftover wedding decorations. I came home and made them into small and large bouquets to place around. Be on the lookout for items in unusual places. Tip #7 Don’t put your pieces out in the same location each year. Mix it up! I love a blank slate when it comes to pulling my boxes of décor out each fall. I’m never one to put something in the same place year after year and really that’s the fun of it all. Be as creative as you would like and it will all feel brand new each year. I hope these few frugal fall decor tips help or encourage you in a time when your budget may not agree with your eyes. Have you found any steals this year? Let us know what you found and how you incorporated it into your home this year. These are really cute ideas and very affordable. Thank you for sharing! I love using creativity to save some dollars. Good tips. These are all cute ways to decorate. I feel like a hypocrite right now. Fall is my favorite holiday, but I have yet to pull out any of my decorations. Online swap shops??? Can you give me an example? Thanks! I try to pick up one nice piece annually. Slowly it grows. 🙂 Thanks for these tips! Looks so great! Thanks so much for sharing at our To Grandma’s House We Go DIY, Crafts, Recipes and more Link Party! Pinned this! Hope you join us again next week!